Home > Ham Radio > Battery Cases > ICOM > BP-130A : ICOM brand 6xAA battery case. 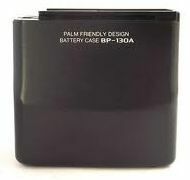 The BP-130A is an ICOM-brand 6 x AA battery case. Black color only. (fits both grey AND black-color radios). For radio models IC-W21A, 2GXA, 2GXAT, V21AT, F10, F20, M10, etc. Load with 6 x AA size Alkaline cells for handy instant power.